Of all the reviews I have ever had to write, none were as simple to write as this one. 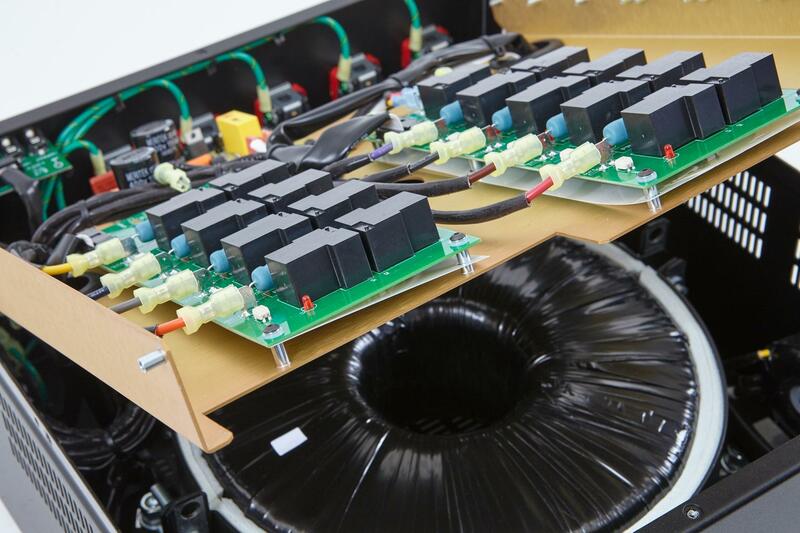 The Torus Power TOT AVR UK toroidal isolation power transformer is basically a whopping great big toroidal transformer in a nondescript box. Its job is to isolate three audio or audio-video devices from the mains. The suffix ‘UK’ is to denote its use of three-pin 13A sockets on the slanted rear panel, and if you buy one in another region, it has different power outlets and another suffix (except in the Americas, where it has three medical grade outlets and no suffix). The TOT AVR is designed for small to medium sized audio systems, using small to medium sized electronics. As a result, it has three sockets on the rear and each one has a maximum current output of 4A. If you want, you can connect the Torus Power TOT AVR to the Ethernet or via a RS232 socket or a 12V trigger should you want to monitor your power or use it to start-up a hidden custom install system. On the front panel, there is a switch, and a small two line blue LED panel, which by default shows input and output voltage, and current delivery. There is a USB charger on the rear panel. The overall look is one of a well-built and functional piece of studio equipment with the side ‘ears’ removed, rather than the aesthetic wonders of high-end audio and its inch-thick front panels. The three sockets and their current delivery effectively limit its use to CD players, streamers, DACs, headphone amps, most integrated amplifiers, and the like. And, when you use the TOT AVR with these components, it improves their performance in entirely predictable ways. These could be taken from the Audio Reviewer book of Clichés: it opens out the soundstage, makes instruments within that soundstage more solid and physically ‘there in the room’, it helps smooth out any nasties in the mid and top, helps improve the dynamic range… basically all those things we strive to improve in an audio system get improved here. As it’s best used with small-to-medium sized equipment that has a component price roughly in line with the price of the TOT AVR, it improves those devices well with no downsides. You’ll hear the improvement in the first few bars of music played with the TOT AVR in place, and you’ll hear it taken away when its removed. A ten minute demonstration would seal the deal and the majority of people would buy one at the end of it. The only exception to the rule seems to be using it with a turntable. In this case, it makes little or no difference to the performance of the deck, unless it has a built-in phono stage. The reason for the bluff writing style is the product is completely free from BS. There is a lot of hand-waving magic tricks surrounding AC power, and the Torus is mercifully free from all of that. Nevertheless, I knew from the outset that the TOT AVR from Torus Power was doing something altogether right because I couldn’t bring myself to write these bluff words, as the next stage in the dialogue is “can we have it back please?” and I don’t want that dialogue. This is one of those all too rare products that does what it’s supposed to do without the need for gift-wrapping or fuss and as a result comes highly recommended.